The 270 km long arterial National Highway (NH-1A[i]) connects Kashmir valley to the rest of India. In 2010, NH 1A was renumbered as NH 44[ii]. The Jawahar Tunnel[iii] linking Jammu with the Kashmir across Pir Panjal Range is on this route. In past, several new tunnels were planned along the road. Among them, Chenani-Nashri Tunnel and new Banihal double road tunnel are reported to be commissioned. Stretches of the highway ran through very precarious terrain[iv]. Hence, the blockage of NH has become a recurring phenomenon for past many years. In February 2018, there were reports of devastating landslides triggered after rainfall and snowfall. The landslides were mainly at Panthyal, Ramsoo, Anokhifal, Nashri, Maroog, Battery Cheshma, Kheri along the Bichleri stream in Ramban district and Udhampur district. Bichleri joins Chenab downstream Ramban. Below is information from various news reports, throwing some light on magnitude of landslides, resultant impacts and possible reasons. Several vehicles stranded on the road including Ramban, Udhampur and Nagrota Bypass, whereas, power supply to entire Paddar-Gulabgarh Sub Division and many other areas could not be restored even after third day of the rain and snowfall. 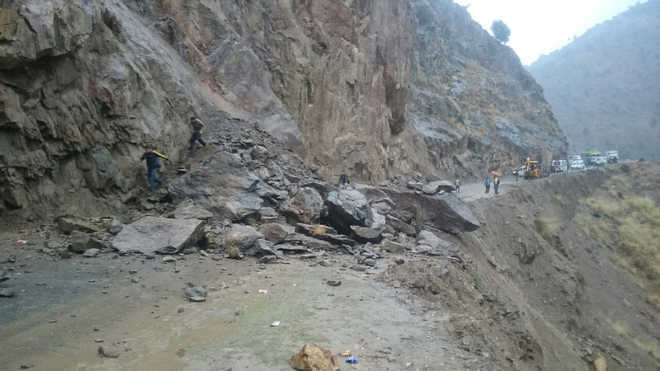 “The digging work of under-construction four-lane highway along existing road at the bottom of steep mountains is the main cause of landslides and shooting stones between Nashri and Banihal,” said a commuter, Farooq Ahmed Lone. The 270 km arterial road, the only all weather link between the valley with the rest of the country, was closed for vehicular traffic after various parts of the highway including Jawahar Tunnel – the gateway to Kashmir – experienced about two feet of snowfall. 2014 Video showing the landslide damaging the road in Ramban district. 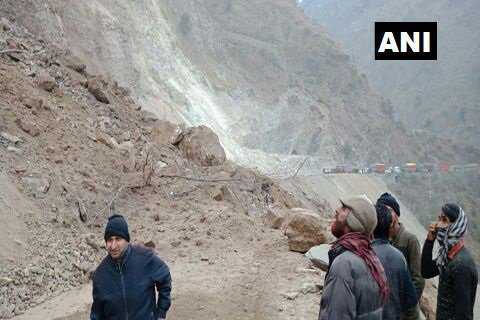 Feb 2012 Landslides and shooting stones blocked the highway. There were landslides in Panthal and Khoni Nallah areas and fresh snowfall in Bannihal and Patnitop sectors and Ramban areas the most accident prone stretch of the highway. In Conclusion We have narrated here some details of the landslides along Jammu Srinagar Highway in Feb 2018 as well as earlier since 2011. This shows that the Highway next to the Bichleri River is prone to landslides and the incidents have also increased due to work related to 4-laning of the 2-lane highway. However, it needs to be noted that many of the landslide sights are on western side of the Bichleri River, while the Highway is on the Eastern side of the River. The narrative above provides impacts of only a small part of the landslides that affect the Highways, but does not include the impacts of landslides on other side of the river. A massive 1856 MW Sawalkote Hydrpower project is proposed[v] on Chenab river, downstream of the confluence of Bichleri River with Chenab. The reservoir of the project (involves 192.5 m high dam, 1159 ha reservoir with 530 million cubic meters of storage capacity) is likely to extend into this landslide prone zone, but the EIA of the project is mostly silent on this issue. In fact the Sawalkote project is only one of the large cascades of hydropower projects[vi] existing, under construction and planned along Chenab River in India. We definitely need a study that in the first place puts together full information about the extent of the landslides that are happening on both sides of the river along the entire affected area. Secondly, we need to analyse the reasons for these frequent landslides and their implications. And lastly this should be basic information before any major intervention is taken up in the area. It should also be kept in mind that this is also seismically active area, besides being prone to landslides and floods, including flash floods. A 3D google earth video of the area.